We are a bit heart obsessed lately as we are fast approaching Valentine's Day! Life has been so busy lately that we haven't had very much time to play or do any simple learning activities! The kids were begging for a heart project, so I whipped this one up quickly and they loved it! I played this with my 2-year-old and my 4-year-old and they made for quite a team! 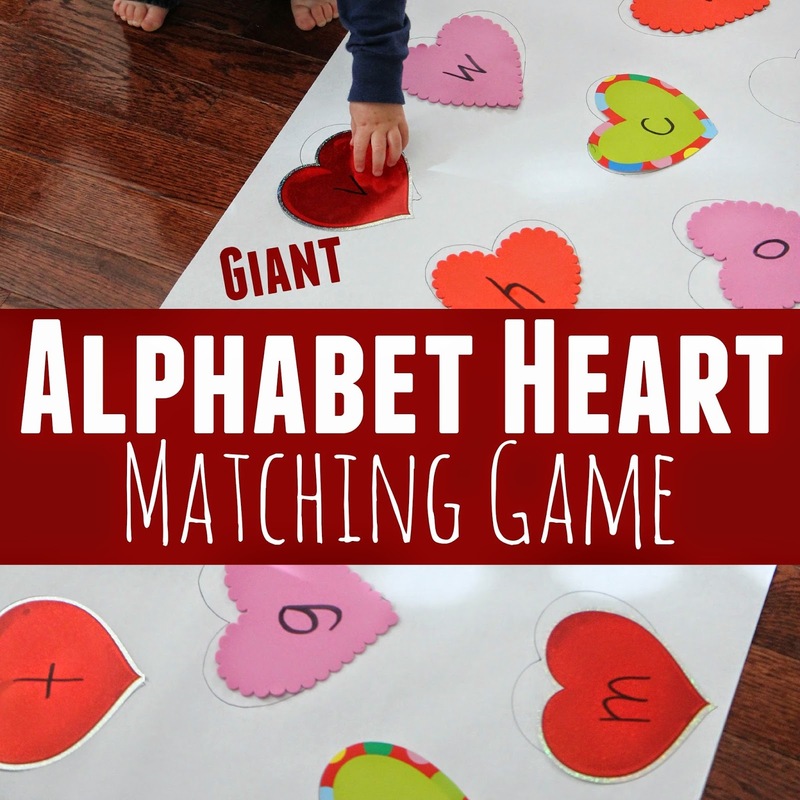 The activity we are sharing today is a Giant Alphabet Heart Matching Game! My kids always prefer giant activities that get their bodies moving versus table activities. I prefer them too since movement activities get lots of their energy out! To get started you'll want to roll out a sheet of large paper and tape it securely to the ground. I usually put tape around the entire thing covering all sides. Today my kids were being calm, so it was fine to just tape two sides. Next you'll want to write alphabet letters A-Z on your cut out hearts and then trace 26 hearts onto your giant white piece of paper too. Make sure you go over the heart outlines with a black marker and then write the alphabet letters on the white paper (inside the hearts) as well. When you are finished writing everything out you should have a matching heart spot on the giant piece of paper for each letter. Now that youe game is set up you'll want to take all of the colorful hearts with alphabet letters on them and move them away from your giant paper. 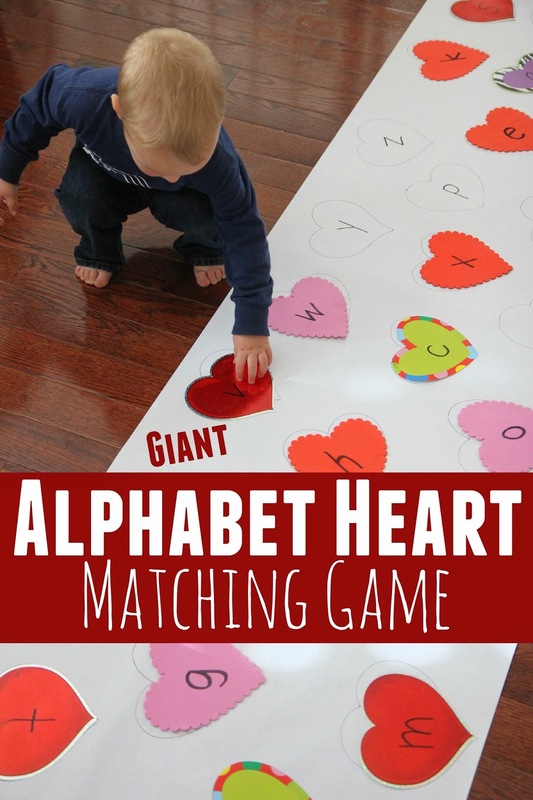 Have kids each select one heart letter at a time and encourage them to try and match the heart letter to the spot on the white paper with that same letter. This is an excellent visual discrimination exercise! My 2-year-old, who only knows maybe 3-4 alphabet letters, did such an awesome job matching letters to their appropriate spot. When he picked up each letter he loved showing it to me! I took advantage of him doing that and said things like, "Cool! You found the letter m it makes the /m/ sound like in monkey!" Sometimes I said the sound, sometimes I said the letter, and sometimes I just said an object associated with the letter. It was fun to see how excited both my preschooler and toddler got doing this activity! My preschool practiced saying the letter sounds while she matched and tried to give me words that went with each letter. I loved to see how the kids worked together on this too. My daughter would occasionally point out where a letter went to my son when he was stumped... and he loved to just bring her hearts and have her put them in the right spot sometimes too. Once all of the hearts were matching and there were no extra hearts, we pulled all of the hearts off and played again! One variation we tried later in the day was hiding the hearts around the room and then requiring the kids to find the hearts and then match them! This looks amazing! Can't wait to try it!